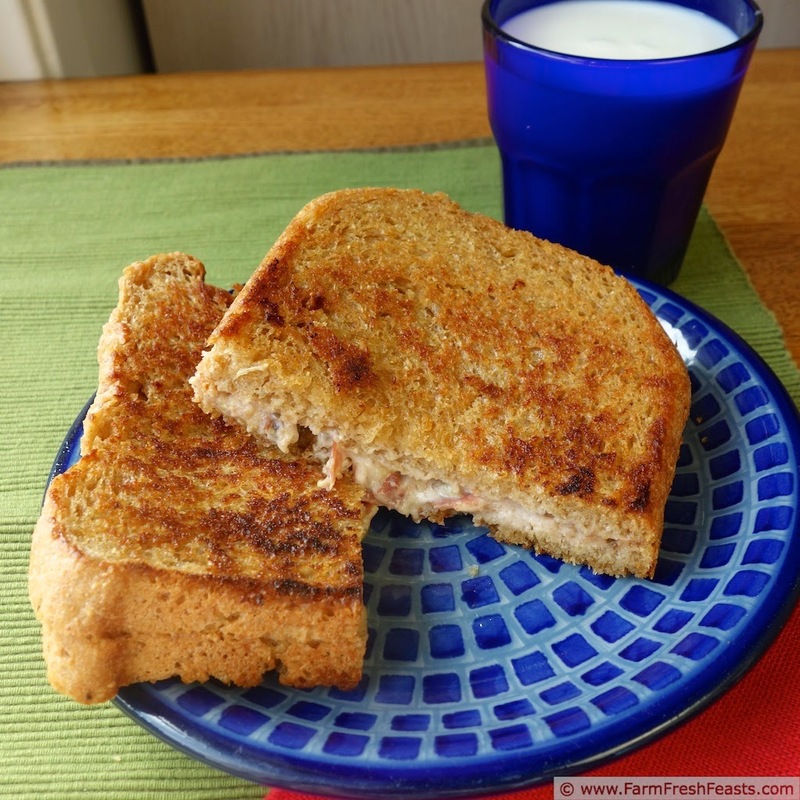 This grilled cheese sandwich is creamy, sweet, and salty all in one gooey bite. Fresh figs, honey, goat cheese and crispy ham make an irresistible combination. Got fresh figs? I'm just a big ol' tease these days. The other day I teased you with the idea of canning your own tomatoes to make Creamy Tomato Soup, even though tomatoes are just a twinkle in my garden's eye right now. Today I'm going to tease you with fresh figs. I had my first fresh figs from our Community Supported Agriculture (CSA) farm share back in Virginia (link to their FB page). 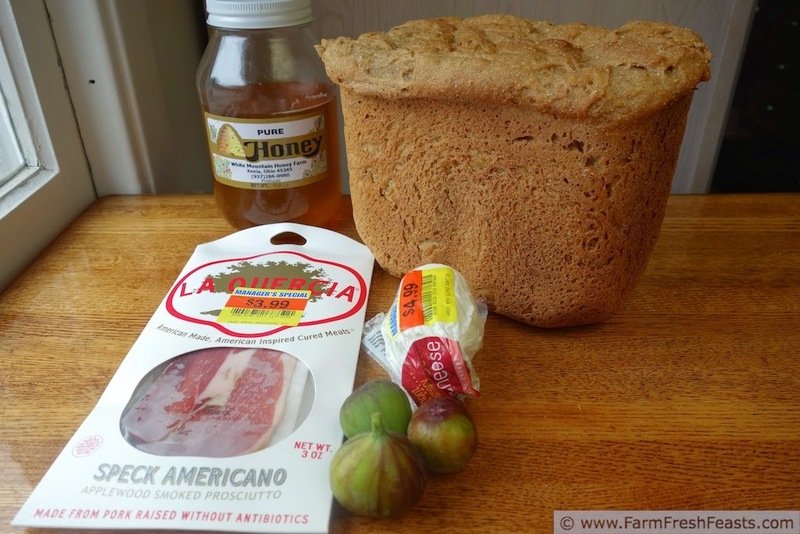 Our farmers had a giant fig tree and shared the fruits with us lucky subscribers. If you ever make have an opportunity to eat fresh figs I advise you to grab that opportunity with both hands. I did, literally [technically one hand was holding a dog leash] and I'm so glad. You will be too, when you see the variety of recipes I'll be sharing using fresh figs this coming summer (pizzas to chutney?). For my first of three grilled cheese sandwiches, I'm sharing a Grilled Goat Cheese and Honey sandwich with fresh figs and speck. Next up will be a Grilled Cheese with Country Ham, Leeks, and Tomato Jam. Finally I'll share another vegetarian grilled cheese since my first one, My Favorite Grilled Cheese Sandwich was getting lonely. This one with Hummus, Guacamole, and Corn Salsa. Today's sandwich is inspired by the Prosciutto, Fig Jam, and Goat Cheese Panini in the cookbook that came with a George Foreman grill. The cookbook is long gone probably buried on a shelf, the grill really is long gone--but the flavor profile remains etched in my memory. 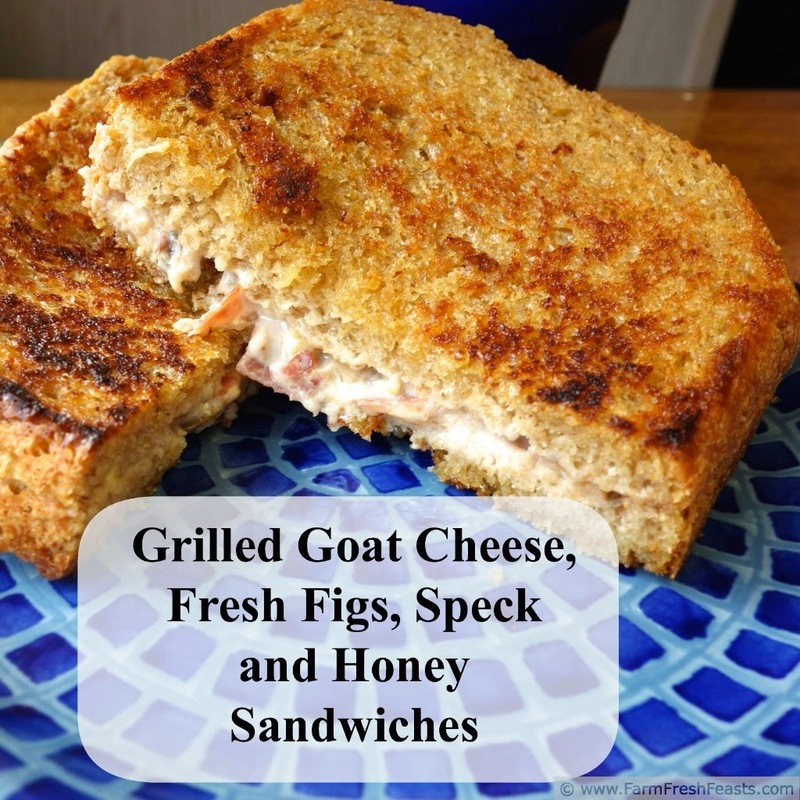 When I saw the fig tree leaf out last Spring, I had this sandwich in mind. For more recipes using fresh figs, should you be so lucky to get your mitts on some, please see my Fig Recipes Collection. It's part of the Visual Recipe Index by Ingredient, a resource for folks like me eating from the farm share, the farmer's market, the garden, the neighbor's garden, and great deals on ugly produce at the grocery store. Brown speck on both sides, about 2-3 minutes per side. Set aside. In a small bowl mix goat cheese, honey, and smashed fresh figs. Sandwich the browned speck in between the bread, and butter the top of the sandwich. Place the sandwich, butter side down, in the preheated skillet. Butter the new top side. 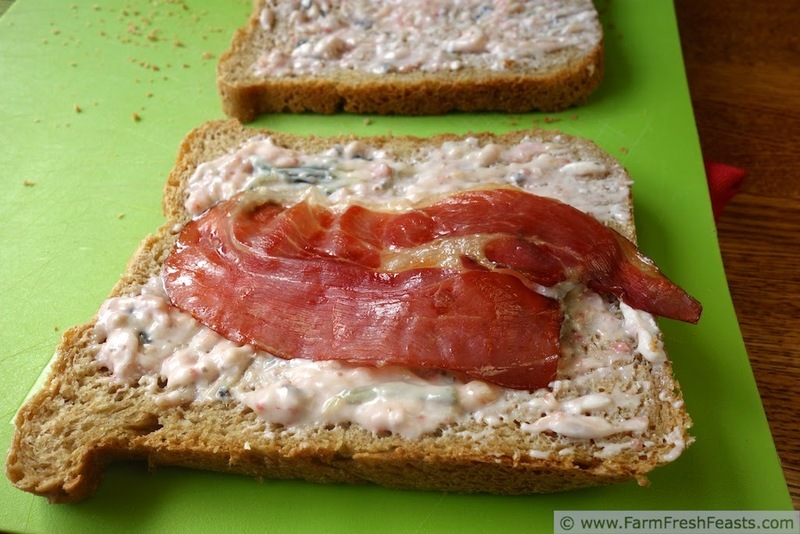 Cook sandwich until lightly browned, about 3-5 minutes per side. Slice and serve. When I went to Croatia, what seems like eons ago now, I had fresh figs stuffed in a chicken breast. It was phenomenal and actually started my love affair with figs. Grilled cheese I have always loved, but I'm thrilled you incorporated the two here. It's like a menage trois with some of my favorite things: bread, cheese and figs. I was deployed to Croatia, spend a good stretch in Zagreb, and never ate figs stuffed in chicken. Whine! Though I did have excellent cured meats and sausages, and we'd buy plenty of chicken to grill outside the hospital on Sundays. Sounds like an awesome grilled cheese! Thanks for sharing at Simple Supper Tuesday. Thanks, Cindy! 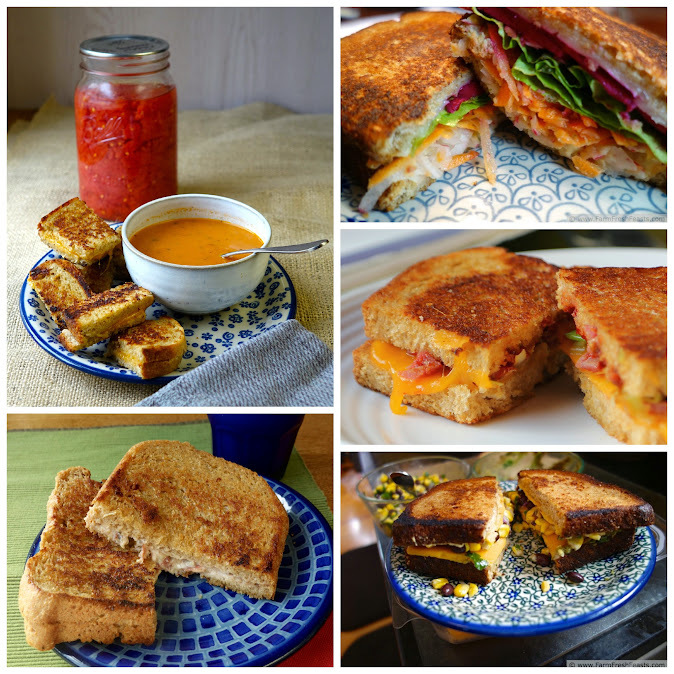 I'm happy to have a simple meal of grilled cheese--utterly tasty and easy.